Next post: A hat! A most magnificent hat! 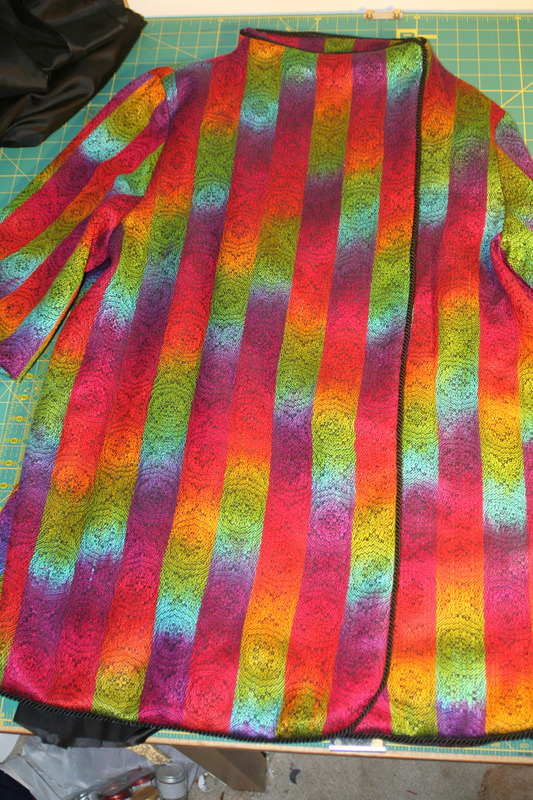 It’s amazing, how nicely the black piping around the edges defines the shape and rescues it from giant-blob-of-color-land.Â I’m still considering whether I want piping around the shoulder seam, where the sleeve meets the body.Â There will definitely be piping on the hem of the sleeve. We are now down to the fussy hand-work.Â I have finished putting the Hong Kong finish on the edge of the bottom facing, and am now understitching the facing.Â By hand. The section to the left of the pin is done by machine.Â See the ugly black line near the piping, and the way it rolls the bottom edge into an unsightly bulge? 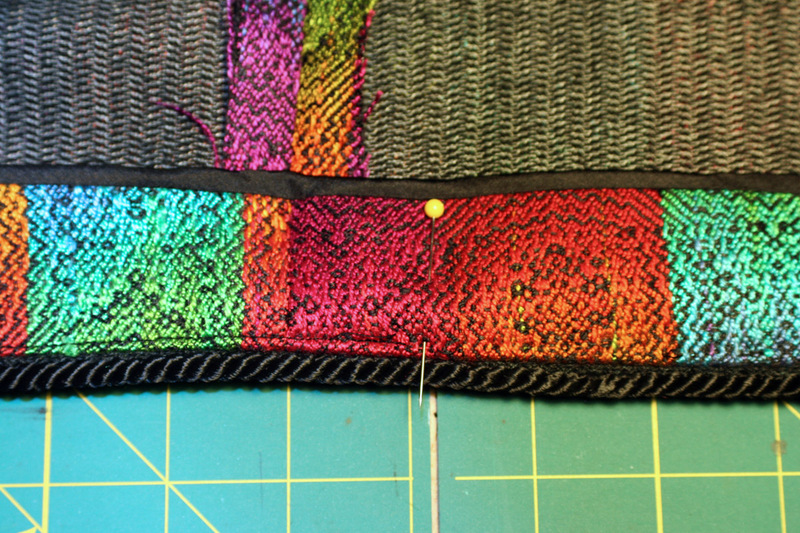 The section to the right of the pin is understitched by hand.Â Â No ugly line and no bulges. After I finish understitching, I will grade the seams, press the garment, catchstitch the bottom facing into place, hem the lining, and put in the shoulder pads.Â By the time I get to Sharon’s on Sunday, there should only be a few finishing touches left – the sleeve lining, deciding whether to put piping around the sleeve seam, and figuring out the fasteners.Â So I think the jacket will be finished (cross fingers!) in about a week. No progress on the hat (yet).Â I’m planning to tackle it as soon as I finish the hand-work on the jacket.Â Probably Friday, or Sunday morning.